A plan some ironically said decades ago was “pie in the sky” may see a document that is close to being final when they meet next week. 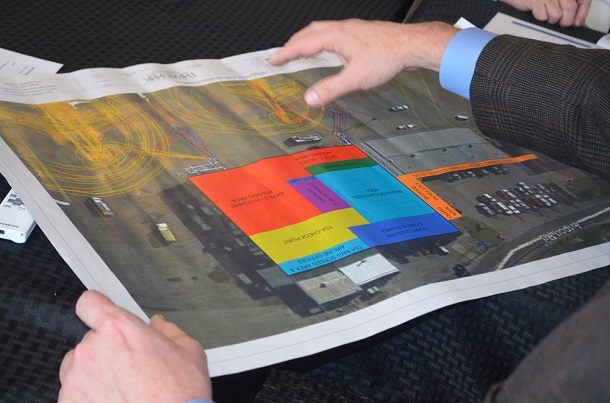 On August 15, members of the Benedum Airport Authority will review plans for a new terminal building at the group’s monthly meeting. Plans have been worked on by The Thrasher Group, who also serves as the airport’s engineer of record. While the terminal will be new, it’s actually going to be a renovation of an existing building. The committee will be converting a hangar that has long been occupied by KCI Aviation and near the existing terminal building. The terminal will come with a likely seven figure price tag. Lang estimates it to be in the range of $6 million to $8 million. The terminal will have more than two jetways. There will also be two gates for service and indoor luggage retrieval. Ticketing areas will also be enlarged. The project will be funded by funds from the airport, as well as the FAA’s Airport Improvement Projects grant program. The project qualifies for AIP dollars, Authority President Ron Watson and NCWV Airport Executive Director Rick Rock have said in the past. Lang said there are three important things to note about the project with the first being infrastructure. He said the renovation of the building in the area it’s being renovated takes advantage of everything already in place. After that, he said the location of the KCI Building is in the middle of everything needed by airport staff and other. He said the synergy of operations is critical to the health of the airport. The third key is that, currently, there isn’t an ideal place to build a new terminal. He said areas on the other side of the runway aren’t cleared and ready for development. Lang wasn’t certain when things would begin, but that he hopes plans – which he said were definitely more than 50 percent complete – get an initial thumbs up from the rest of the Authority to keep moving ahead. Eventually, Lang said he’d like to see everything done by the end of 2019. The August 15 meeting begins at 3 p.m. The meeting is open to the public. 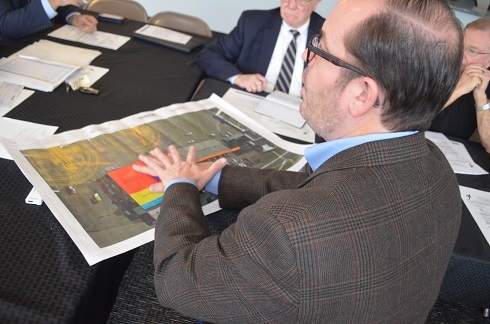 Editor's Note: Mayor and Benedum Airport Authority member Andy Lang shows preliminary plans at the February meeting of the Benedum Airport Authority in the top photo. Bottom picture shows a close up of the plans. More detailed and plans closer to being finalized are anticiapted to be revealed at the August 15 meeting of the Authority.